Czechs have gone to the polls to elect deputies to the lower house of parliament, the Chamber of Deputies. How is the Czech parliament organised? There are two chambers - the Chamber of Deputies and the Senate, or upper house. The Chamber of Deputies is made up of 200 deputies elected for a four-year term on the basis of proportional representation. The Senate has 81 members elected for a six-year term on the basis of a two-round majority system. Every two years, one-third of the Senate's seats come up for re-election. The next Senate election will be held this autumn. How did things stand in the Chamber of Deputies before the vote? 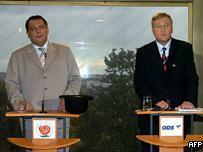 The current elections to the Chamber of Deputies are the fourth since the Czechs' velvet divorce from Slovakia in 1993. In the last election, held in 2002, the centre-left Social Democrats (CSSD) won 70 seats, the centre-right Civic Democrats (ODS) 58, the Communists (KSCM) 41, the centrist Christian Democrats (KDU-CSL) 21, and the centre-right Freedom Union (US-DEU) 10. After the election, the Social Democrats, Christian Democrats, and Freedom Union formed a coalition government based on the slimmest possible parliamentary majority of 101 seats. The opposition consists of the Civic Democrats and the Communists, who together have 99 seats. The election campaign has been fought mainly as a battle between the Social Democrats and the Civic Democrats. The Social Democrats - who have been in power for the last eight years - stand for traditional Social Democratic values and have made the preservation of the welfare state the main plank of their election platform. They have pledged to raise pensions and the minimum wage, and to close the gap with EU living standards by 2013. The Social Democrats are strongly pro-European, are in favour of the European Constitution and aim to introduce the euro in 2010. They are led by Czech Prime Minister Jiri Paroubek. He was appointed to the premiership in April 2005 after former prime minister and party leader Stanislav Gross stepped down over allegations of financial impropriety. The opposition Civic Democrats are a centre-right conservative party that advocates a liberal economy without major state intervention. They have promised to introduce a 15% flat income tax, a single 15% VAT rate, and to abolish all other taxes. They favour a more cautious approach to the adoption of the euro than the Social Democrats. The Civic Democratic Party was founded by the current Czech President, Vaclav Klaus, who led it for 11 years. Mr Klaus only stood down from the post of party leader when he decided to run for the presidency in 2002, and his successor, Mirek Topolanek, is thus only the second ODS leader in the party's history. The election campaign focused mainly on the economy, the future of the Czech Republic's generous welfare system, and allegations of sleaze in high places. How did the results turn out? The results were so close that they leave the Chamber of Deputies neatly spilt down the middle. The Civic Democratic Party has won 81 seats, and its Christian Democrat allies picked up another 13. With support from the Green Party, which won six seats, they could just reach 100. But the Social Democrats are equally stymied, winning 74 seats, with the Communists on 26. Turnout was 65%, compared to 58% four years ago. The Civic Democrats polled the biggest share of the vote - just - with 35.4% to the Social Democrats 32.3%. So Mr Topolanek will get the first shot at forming a workable coalition. But it is hard to see how he can gain a majority. It was a good election for the Greens, who polled 6.3% and so for the first time crossed the 5% threshold needed to gain parliamentary seats. But their six seats won't be the pivotal force that the party had hoped. The Greens have already said they wouldn't enter a coalition with the Communists. And both the main parties have ruled out a grand left-right coalition. Mr Topolanek has a hard task ahead.